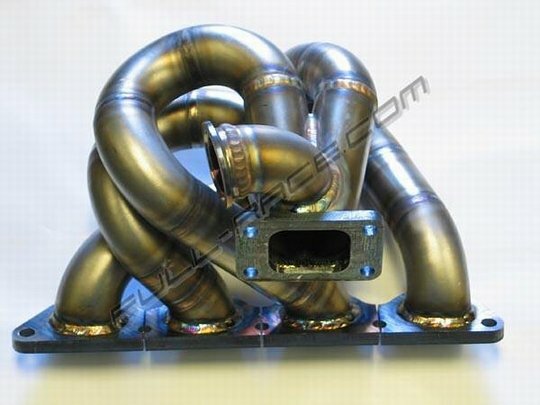 Full-Race tubular turbo manifold designed for the Mitsubishi EVO 8. This high performance manifold is intended for tuners seeking maximum performance! This manifold retains powersteering, air conditioning, and stock radiator placement while allowing use of large turbochargers and full 3.0 in. downpipes. This manifold is flanged for T3 family turbines and TiAL 44mm wastegates only. We also offer a wide range of T3 bushing and ball bearing sized turbochargers. A Full-Race manifold, turbo, and downpipe combination will effectively support your goals. Including everything ranging from road race to drag race type powerbands and enlivened daily drivers! - High quality thick wall stainless steel ensures manifold reliability. - Robotically TIG welded for maximum strength and longevity. - Low angle merge collector design. - Collector placement allows use of TiAl 44mm wastegate. - Turbine placement allows use of full 3.0 inch downpipe. - T04S style compressors will fit. - No modification to the radiator necessary.